Week 22 – 100th Day of School Celebration! Another short week (for me, anyway – I was off on Monday and Tuesday)! I put together 20 areas in the library with a blanket and a basket. In the basket are at least 5 books, notecards for each book with the title of the book, paper, crayons, puzzles, games, etc. Our Kindergarten teachers get 3 or 4 volunteers per classroom to come and read to a small group (we end up with 5-6 kids at each group). At 8:30am, our Kindergarten students come in and find a grown up to read with. For the next 40 minutes or so, they read with their grown up, taking breaks as needed. We also have whole group breaks where our teachers lead the group in “Toody Ta” and other songs that get them singing, dancing, and having fun. As the groups finish reading each book, each person in the group signs their name on the notecard with that book title’s label. They hold the notecard up and someone collects it. 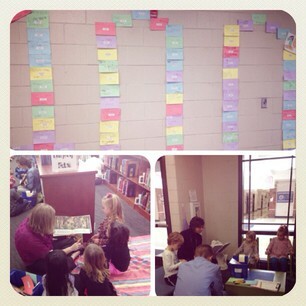 While the event is going on, my assistant puts the notecards on a wall in the library in the shape of a 100 so that when the kids leave, they see how many books they read. It’s so fun and pretty easy to pull together. I hope you are having a SUPER SUNDAY! 1 Response to Week 22 – 100th Day of School Celebration!